Last Friday night Stuart and I went to see Michael Urie's one-man show Buyer and Cellar at the Menier Chocolate Factory in London's somewhat glitzy London Bridge Quarter. The conceit of the play came after the writer Jonathan Tolins stumbled upon a passage in Barbra Streisand’s coffee-table book, My Passion for Design, that mentioned the fact she has built for herself a shopping mall beneath her Malibu estate. Inspired by that curious tidbit, Tolins invented a character, Alex, a young, gay, out-of-work actor in L.A., and spins a fiction in which Alex gets hired to be the sole shopkeeper in this mall for its sole customer, Streisand. When Streisand visits the mall to shop, the running joke is that she comes by to buy what she already owns. And so, absurdly, Alex and Barbra haggle over the price of an antique doll she wants. The play is very funny, full of zippy one-liners and the audience was in stitches. 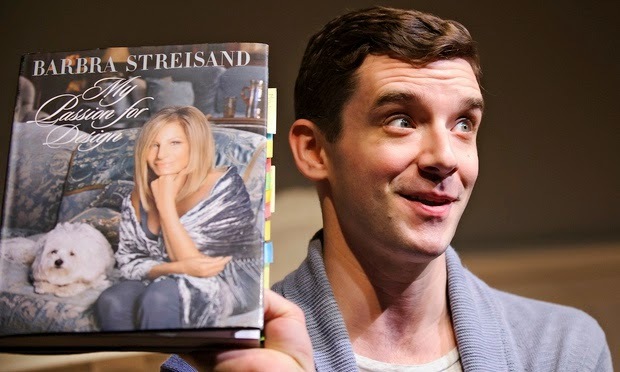 Adorably, Michael Urie seems genuinely to be enjoying the audience’s enjoyment. While the audience is laughing at something he just did or said, an impish grin will flash on his face as if to share the delight. This has the uncanny effect not of diminishing audience response by stepping on the laughs but of amplifying them. Urie’s being in on the humour enhances the spirited connection. And it is perhaps a tad disingenuous to say that you need three things to enjoy this US import: a fetishistic fascination with Barbra Streisand, total immersion in showbiz and a love of high camp. You don't. But any or all of the above would certainly help. So well worth a visit.